Eczema, also known as atopic dermatitis, is a chronic skin condition that causes itchy, dry skin. Children with the condition often inherit a genetic tendency toward dry skin, as well as underlying allergies that cause eczema break-outs when exposed to allergens. Eczema is a disease of your child’s entire body that manifests itself on the skin. Events that upset your child’s system, such as stress, illness or teething, can exacerbate eczema. If you suspect your child has eczema, make an appointment with his doctor for an evaluation. Teething does not cause eczema, but it can make the condition worse. Infants with eczema already suffer from easily irritated skin. Saliva from the constant drooling that accompanies teething can build up around your child’s mouth and chin and cause eczema flare-ups. Eczema flare-ups look like red, raised, slightly oozing patches. In teething infants, they frequently appear around the mouth and on the chin and cheeks. Children with eczema often have dry, rough-textured skin often scattered with scaly white patches. Other common locations for flare-ups include skin creases, such as behind the knees and inside the elbows. Teething can cause an itchy, red raised rash even in children who do not have eczema. This rash, referred to as a “drool rash” by AskDrSears.com, is a result of the constant irritation from wet saliva. Unlike eczema, this rash does not involve allergies and is not a chronic condition. Skin irritation from teething should improve on its own as soon as your child’s teeth make it through the gums. Keeping your child’s skin well-moisturized is key to preventing eczema flare-ups. 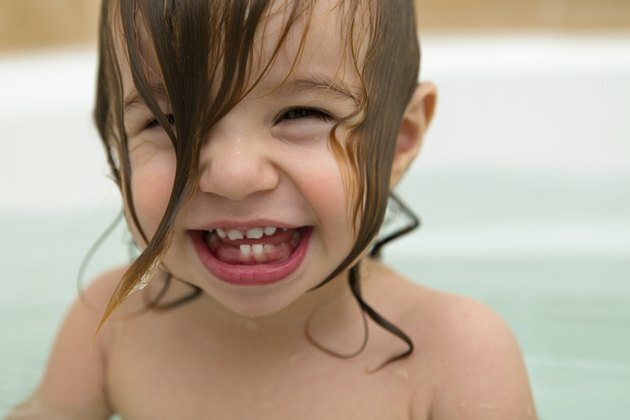 Wash your child’s face, neck and cheeks with lukewarm water and gently pat it dry. Use a mild, gentle soap sparingly -- constant washing with harsh soaps can strip away protective oils. Apply a thick moisturizing cream on areas affected by teething to form a protective barrier against wetness and irritation. Itching -- and the subsequent infections caused by scratching at itchy skin -- are a major problem for infants with eczema. To control the itching, you may be able to use oral antihistamines including over-the-counter medications containing diphenhydramine and prescription non-sedating allergy medications, but check with your child's pediatrician first. If you notice signs of infection, such as increased redness in eczema-prone areas or a honey-colored fluid oozing from the rash, contact your doctor.